CHICAGO – Brinks Gilson & Lione, one of the nation's largest intellectual property law firms, is proud to announce that shareholder and firm President Gustavo “Gus” Siller and shareholders Yuezhong Feng and Tadashi Horie, have been named to Crain’s Custom Media 2018 list of Chicago’s Notable Minority Lawyers. 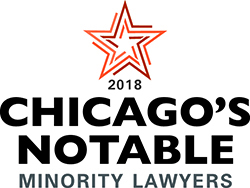 The list recognizes minorities in law with commendable legal abilities who have significantly contributed to their community and legal industry over the past year, mentored other minority attorneys, and/or held leadership positions outside of their own organizations. Gustavo “Gus” Siller, shareholder and president of Brinks Gilson & Lione, is an IP litigator and licensed patent attorney with extensive experience in district court litigation, patent prosecution and post-grant proceedings. The first minority president in the firm’s 100 years, Gus has made great strides in restructuring the firm and its culture to further bolster diversity and inclusion. Under his leadership, the firm received The Chicago Committee’s Diversity Award for Most Partners of Color in Firm Management. Yuezhong Feng, shareholder and co-chair of Brinks Gilson & Lione’s China task force, is an IP litigator with experience in complex patent, trade secret, Hatch-Waxman, International Trade Commission and U.S. Patent and Trademark Office post-grant cases. Fluent in English and Mandarin, Yuezhong was deeply involved in the firm’s planning and recent opening of its Shenzhen office. Tadashi Horie is a shareholder and IP lawyer at Brinks Gilson & Lione. In his 26 years at the firm, most of his practice has been dedicated to patent prosecution. Fluent in Japanese and English, Tadashi has helped many international companies prepare and negotiate licensing agreements in the U.S. Named one of Illinois’ 2017 Super Lawyers, Tadashi’s deep understanding of complex technologies makes him a highly sought after and respected attorney.